Although the two days I spent in Shenandoah National Park last June were mostly rainy with heavy fog, I managed to get close enough to this adorable just-born fawn for some clear images. 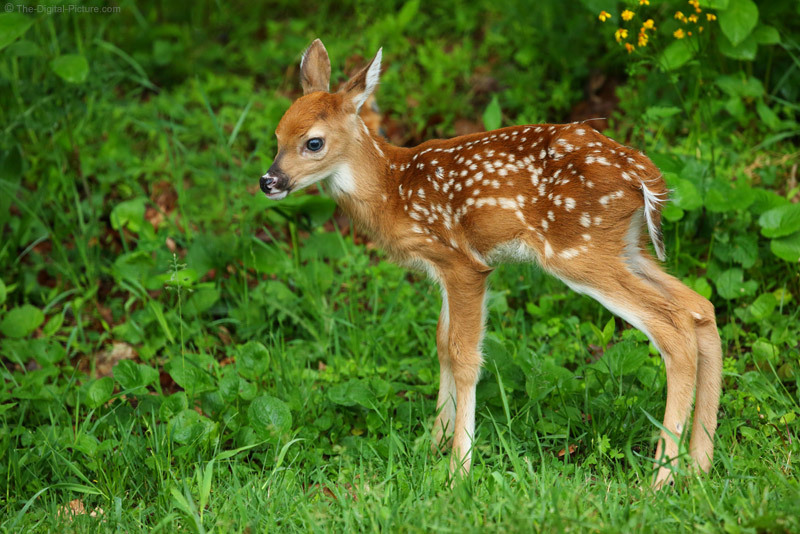 The white-tailed deer fawn may be my favorite baby animal and this photo alone would have made the trip worthwhile. My camera choice for this trip was the EOS 5D Mark III. I made this choice for the combination of image quality (the EOS 5Ds and 5Ds R had not yet arrived) and AF performance. While I had several telephoto lens choices along, the Canon EF 200-400mm f/4L IS USM Lens was my primary wildlife lens. The deer I photograph in Shenandoah National Park are often at least somewhat approachable (though mothers with fawns seem to be an exception), making 400mm often adequate and the 560mm option is available at the throw of a switch. The other issue is that getting close to the animals is often a requirement to eliminate trees and other obstructions. The need to get closer makes even 400mm on a full frame body very frequently too long (unless head shots are desired). The zoom range feature of this lens offers plenty of flexibility in framing at a range of subject distances. My second choice lens on this trip was the Canon EF 100-400mm f/4.5-5.6L IS II USM Lens. This is another incredible lens that offers an even longer focal length range than the 200-400. Yes, the 200-400 has the built-in extender, but the 100-400 is also compatible with extenders. The 100-400 is considerably smaller and lighter, but the 200-400 has a wider aperture – a full 1 stop wider at the long end. As I mentioned, the weather was rainy with heavy fog, which translates to dark and being able to stop motion in 1/2 as much light was important. The next thing you are going to say is that ... this photo was captured at f/5.6. That is correct. The fawn happened to be at the edge of a clearing with an above-average amount of light on it. It had been nursing from its mother moments before and I was using f/5.6 to gain some depth of field. So, in this case, the 100-400 L II would also have worked well. Moments later, the fawn was bouncing around in the woods and ... that meant that the 200-400 L was the right choice.